The Madagascan Mannikin occurs throughout Madagascar. The Madagascan Mannikin is primarily a bird of arid scrub, but it also frequents grassland, forest edges and clearings in primary forest, cultivated areas including ricefields, marshes, eucalyptus forests and areas around villages, from sea-level up to 2,000 metres of elevation. The Madagascan Mannikin gives distinctive “tsirrip”, “tsitup”, “piwisit” or “pisit” often in chorus. It also utters a single “pit” or “tsip” used as contact call. The song is a short, burbling “whirr” usually repeated several times without pause. Other calls include a soft “tsu” given towards perched rivals, and a sharp, descending series of calls during the long chase flights. The Madagascan Mannikin feeds primarily on seeds of grasses, sedges and other herbs of several species. It probably catches insects too. It forages in open areas where it can find small seeds, including in cultivated areas. It is very gregarious and usually occurs in single-species groups when feeding, but sometimes, it joins mixed-species foraging flocks, often with other seed-eater species. 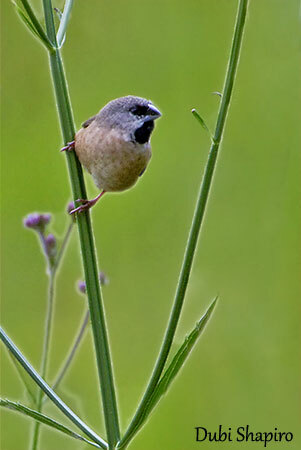 They are constantly moving, climbing along stems or flying from clump of grass to another. They descend on terrestrial food sources in small groups, but once a large flock is on the ground, it may damage the cultivated fields and the species is sometimes considered a pest of rice. They usually perch side by side on the same branch, close to each other until touching. They probably roost in this way. The Madagascan Mannikin male displays and sings while holding some grass, fibre or other nest material in the bill. It performs a bobbing dance by stretching and bending its legs alternately. A receptive female will crouch and solicit with quivering tail. The copulation is followed by bill-pecking and mutual preening. The Madagascan Mannikin is resident and sedentary on the island. It only flies when feeding from place to place and only performs short-distance flights. The Madagascan Mannikin breeds between September and July. The nest is an oval-shaped structure. There is an entrance with porch at one end. It is placed in bush or tree, and made with grass, pine needles or palm fibres woven with grass stems. However, it may use an old abandoned nest of other species, and only adds a lining of grass inside prior to the laying. The female lays 3-8 whitish eggs. The incubation is shared by both adults, but the duration is unknown in the wild. In captivity, it lasts 11-12 days. At hatching, the chicks have strong markings inside the mouth on the palate, below the tongue, at gape and along sides and tip of lower mandible. The nestling period lasts from 21 to 31-33 days. The young are able to feed themselves 9-10 days after leaving the nest. The Madagascan Mannikin is common and widespread throughout Madagascar, but it is more common in North. The population is suspected to be stable and not globally threatened. The Madagascan Mannikin is currently evaluated as Least Concern. The Madagascan Mannikin is endemic to Madagascar where it is common and widespread throughout the island. It frequents cultivated areas, grasslands and clearings of primary forest, but it is primarily a bird of arid scrub. It feeds mainly on seeds of several plant species, but it probably takes insects too. The Madagascan Mannikin is a gregarious species that occurs in flocks all year round, both family groups and mixed-species flocks. However, it is solitary nester or occasionally breeds in small group. The courtship displays include several unique postures accompanied by songs. The Madagascan Mannikin is not currently threatened. The Madagascan Mannikin has brown to grey-brown upperparts with darker, mostly blackish-brown flight feathers (primaries and outer secondaries) and tail, whereas rump and uppertail-coverts are yellowish. The underparts are pinkish-buff with indistinct grey-brown spotting. Body sides and flanks are pinkish-brown. The undertail-coverts are dark grey-brown with broad pale buff tips. Underwing-coverts and axillaries are buff. The head is grey with indistinct blackish mottling on crown. Nape and neck sides are brownish-grey. The face is grey, whereas lores, chin and most of throat are black, forming a small black bib on the latter. The two-tone bill is blackish above and pale grey below. The eyes are brown. Legs and feet are pinkish-grey to fleshy-pink. The juvenile has dark greyish-brown upperparts and grey underparts. It lacks black lores and bib. The bill is often all blackish but sometimes paler on upper mandible.